Can an Astrantia be started in a pot, then replanted in garden in the spring? 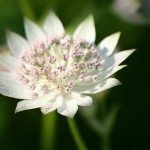 Yes, you can plant Astrantia from seed indoors, then transplant to the garden later. The seeds need to be cold stratified first- in nature this happens outdoors during the winter, but you can achieve it by placing them in the refrigerator for 2 to 3 months. Then they will be ready to plant indoors.